Amazon's growth in the B2B wholesale distribution industry has not gone unnoticed. As customer purchasing shifts towards digital and margins are under continuous pressure, many are wondering how to compete with a company that doesn't even need to deliver a profitable return for up to 5-7 years. At ENAVATE, we work with distribution experts, our customers and partners, to help independent distributors face their toughest challenges head-on. Our forward-focused strategic thinking prepares you for lasting success. Get this practical advice in this eBook. How to get started today creating your plan, and then turning that plan into a reality. 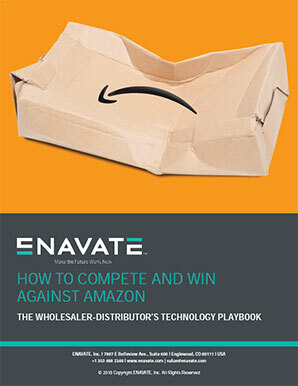 Download ENAVATE's eBook, specifically for wholesaler-distributors, and start building a winning business and technology to compete with Amazon today.